Joy Malone meets Indelible Ink when he tries to cut out her eye one night in a club. Instead of doing just that, he instead leaves his signature mark on her, marking her as belonging to him. This forces her to become part of his world, but also puts her in danger. She begins receiving messages at all hours from all sorts of creatures because they believe her to be Ink’s chosen one. She is forced to figure out where she belongs–in Ink’s world or her own. This book had one of the most original stories I’ve come across in awhile. The way Ink and his sister Inq go around marking people was such a fascinating concept to read about. All of the characters were extremely well developed and I especially liked Inq’s role in the story. The relationship between Ink and Joy didn’t seem forced at all and I loved how they grew to care for each other. Joy herself was a great character and she grew a lot throughout the book, becoming more confident in her own abilities. Metcalf does a great job of constructing the world of the Twixt. It is fascinating yet confusing, but I feel like this is exactly how Joy felt as she was experiencing it so it made me feel like I was right there with her. The writing is very descriptive and makes the world of the Twixt just that much more vivid. Overall, Indelible was an incredible book with such an original idea. I can’t wait to read what happens next! 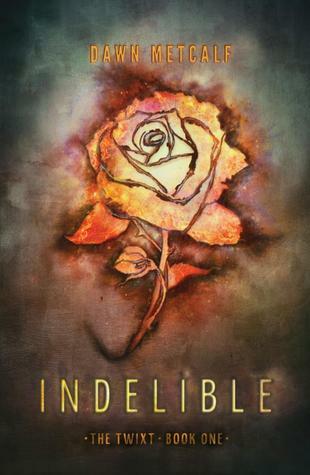 Indelible was released on July 30, 2013 and is the first book in the Twixt series. The second book, Invisible, is expected to be released on April 29, 2014.